Minister Jung-Bae Chun said, “we have to respond with determination to the criminals such as organized gangsters who threaten people’s lives,” and “national law and order will be firmly established by preventing the abuse of mega power and fairly applying law” and gave hope. It was the statement of the Minister of Justice who might confront the substance of the mega power of those who tried to kill me even abroad accusing me as criminal of thoughts and as anti-government. How will he deal with the errand men who perpetrated political violence for President Kim, Dae-Jung? Should I think that he would cover up like other persons in charge of the Ministry of Justice and Prosecution? How will Minister Chun, Jung-Bae, who speaks of the precious value of human rights, deal with the mega power of those who try to conceal the terrorism with brutal means? When the terrorists freely hold welcome and farewell meetings and let the entire world know, how will Minister of Justice Chun, Jung-Bae deal with something of that nature? Minister of Justice Kim, Seung-Kyu, who said “Justice is to pay price life for life”, became Director of National Intelligence Service without dealing with terror incident as if nothing happened. 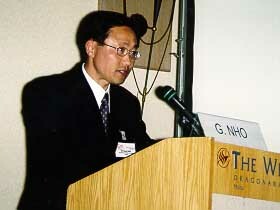 Gil-Sang Roh who is Chief of Insurance Policy Department (Ministry of Health and Welfare) was selected to be the Best Chief of Department for 3 consecutive years in succession to 2002 and 2003. The national leader and Minister Chun should know that it makes one wonder for whom the reformation and the human rights are, when they are yelling out reform and human rights while the terrorists freely hold a farewell meeting, announce their news on the internet, and get selected as the Best Chief of Department for 3 consecutive years. 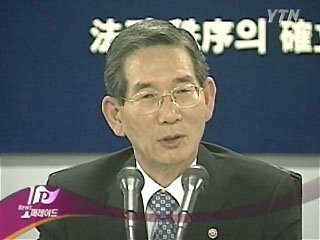 Can Minister of Justice Jung-Bae Chun do what Minister of Justice Seung-Kyu Kim passed by closing his eyes? Or is he going to cover up like ex-Minister of Justice Kim, Seung-Kyu did? I am asking a question whether Minister Chun, Jung-Bae can block the “abuse of mega power” and deal with terrorist activities. President Roh, Moo-Hyun and Minister of Justice Chun, Jung-Bae should immediately disarm the terror ring members. President Roh, Moo-Hyun and Minister of Justice Chun, Jung-Bae should immediately stop oppressing the terror victim by mobilizing even the intelligence agency and the police. The above request is effective even to the successor Minister of Justice. Bae, Yang Hong who tried to destroy me with drug, accusing me as pro-Kim Il-Sung leftist, became a General, and Roh, Gil-Sang who is a bioterrorist and one of those who accused me of anti-Kim Jung-Il extreme rightist became a desirable civil employee. Is it a human rights defense for citizens?